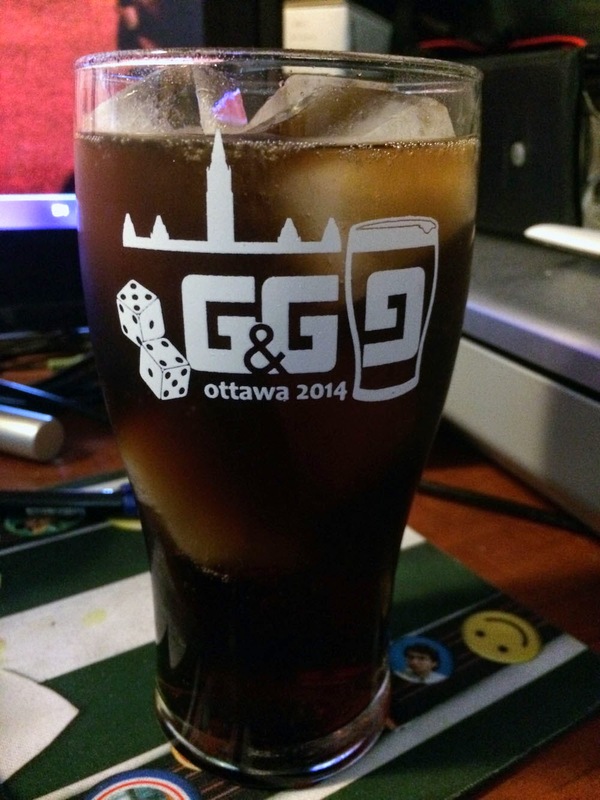 I'm still working my way through the hundreds of photos I took in Ottawa at Gaming & Guinness IX, but in the meantime here's a shot of my first use of one of the terrific swag items created by Mike and Rob for the event: the official G&G IX tumbler. Sure, it's full of Coke rather than Guinness, but I think it's still serving a noble purpose. I'm quite taken with the logo design: the tumbling dice, which has become a recurring theme in the logos, the reversed "G" serving as the 9, the rocket-looking silhouette of Parliament, evoking any number of spaceships from games we played like Firefly or Warhammer. Excellent job, gentlemen.